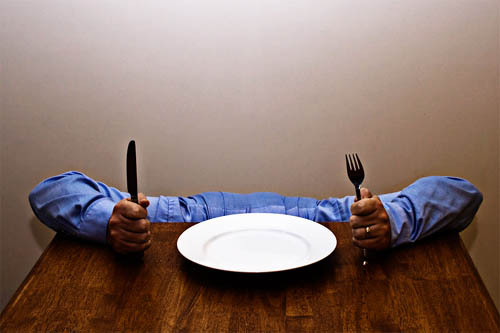 Both juice and water fasting can cause periodic hunger. For some, the hunger during fasting can be difficult to overcome while others have fasted for 30 days without any hunger. Tips to drastically reduce hunger during fasting. 1. Remove the pulp with a strainer from the juice because pulp continues the body’s digestive process. Fiber is health and needed when you are eating but during a fast is just build up in the colon and can create hunger. 2. Enemas will alway shut down hunger during a fast no matter how intense. 3. Green juices, with watercess, and bitter greens will stop hunger in seconds. Even a sip is enough to stop hunger. 4. Drink a glass of water. A full stomach lessens hunger in seconds. 5. Hunger is periodic during fasting and as the body goes through cycles of catabolism and detoxification hunger can go from intense to no hunger in a 20 minutes. Waiting for hunger to pass take discipline but also build self-control. With these simple techniques, you can reduce the sensation of hunger during a fast. I find my biggest struggle is getting control of my mind. It may be as simple as shrugging and saying – in your head or out loud – “Meh. I’m not hungry.” The more you think about NOT having food in your belly, the worse you will feel. Wrap your head around even enjoying the sensation of hunger. It’s just your body sending a signal. Observe it, but don’t react. Then dismiss it. Another suggestion would be to anticipate hunger pains, they will be inevitable. Have a diversion ready: when I got hungry, I recognized that it was actually boredom in disguise. So go for a walk, play your guitar, “eat” a book… And in your mind visualize the enjoyment you derive from these activities as satiating your hunger. Sounds crazy but it works! The root cause of all discipline failures is a combination of low self esteem,and emotional relationships with food using pleasure of eating to push away uncomfortable emotions leading to a guilt, binge, guilt cycle. Even if you do fast you will break it badly and binge. They a fruit diet for 5 days, and work on your thoughts, meditation, positive affirmation, prayer, etc. I use an enema to get past the hunger of the first 2 days but even if you can fast… you will fail to break it correctly and feel horrid.